Hello GKN Sweden! My name is Dominic Miceli, and I’m a Trainee from Newington CT, USA! I was born in August, 1995 and raised in a small town called Burlington, Connecticut. I spent most of my childhood hiking through the woods near my house, and playing soccer (yes soccer) where I developed a strong sense of mental toughness and teamwork; skills which have prepared me for the challenges I would face over the next four years as an engineering student. My journey as an undergrad took off when I joined a small engineering project team called the CCSU NASA Rover Challenge Team. On this team we designed and built a four wheel, two person, human powered “rover” to compete at the annual NASA Rover Challenge competition at the US Space and Rocket Center in Huntsville, Alabama. I eventually became the project leader for this team where I managed design improvements across the whole rover, and designed and manufactured a steering bell crank system myself. My involvement in this project allowed me to gain valuable hands on technical knowledge, and project management experience. I finished my engineering courses while working full time, going to school at night, and working on the rover and my senior capstone project even later at night and on weekends. Eventually I picked my head up long enough to notice that I still had 4 (non-engineering) courses to take in order to graduate. At this moment, I decided to study abroad. I ended up choosing a school just north of London where I finally left the USA for the first time on my way to move in. Living in London allowed me to see the world from a completely different perspective. I traveled to 10 different countries over the course of 5 months and have been to another 4 since then, and counting! 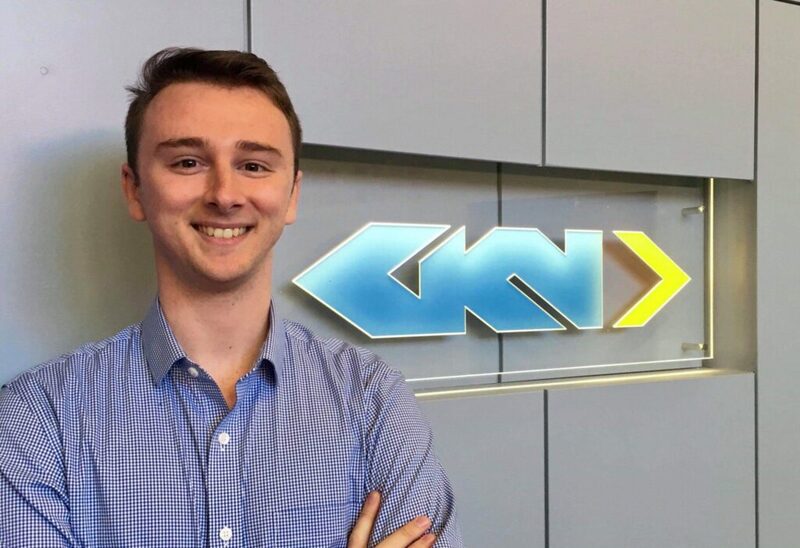 After returning home from London I knew I wanted to work for a company with a global footprint, in aerospace manufacturing, and that is also a great place to work. After starting in Newington as a Trainee, I worked with the Manchester LPC vane team to find a machine that would give us more control over the current process for super polishing airfoils. 6 months later, two machines have been purchased and we expect to be up and running by the end of 2019! Today, I’m here in Sweden to learn about the world of additive manufacturing. I’ll be working with the research and development team at PTC to learn about a process that they’ve been developing to bring the very first AM process into production in Newington! I’m excited to be a part of the small but growing AM community, and I cannot wait to see how the technology shapes the aerospace industry to make flying safer, cheaper, and more environmentally friendly!